Richard Speight Jr. directs Supernatural S11E08. Photo: Bettina Strauss/The CW. 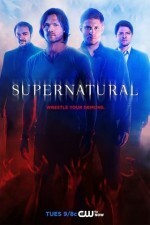 Season 11 of Supernatural has been a powerhouse due to great writing, acting, and directing. Episode 8 of Season 11, “Just My Imagination,” will be directed by former series guest star Richard Speight Jr. Speight previously co-directed the film North Beach (2000). He also wrote and directed the comedic short America 101 (2013). This will be Speight’s first time directing an episode of Supernatural. Speight’s last appearance as our favorite archangel Gabriel was in the Season 9 episode “Meta Fiction.” Fans remain hopeful he’ll make a reappearance in some form during Season 11, as the Winchesters need all the help they can get to defeat the Darkness. Speight has kept closely connected with the Supernatural franchise through the years. At Supernatural conventions Speight entertains fans as emcee, alongside his close friend Rob Benedict (who played prophet Chuck Shurley). Speight and Benedict also hosted the Supernatural panel at Comic-con 2015, bringing a lot of fun to the event. Speight and Benedict will also be showcasing Supernatural cast and crew in their new show Kings of Con, which provides a comical look at the convention world. In the episode “Just My Imagination” Sam Winchester is visited by his childhood imaginary friend Sully (played by Nate Torrence). Sam is surprised not only to be seeing Sully, but to learn that he wants his help. The episode will include flashbacks showing the friendship between Sam and his imaginary friend. Sully isn’t the only imaginary friend who the boys encounter. Jared Padalecki as Sam and Director Richard Speight Jr. in “Just My Imagination.” Photo: Bettina Strauss/The CW. Padalecki joked about how Speight kept referring to them as their characters names while directing because he was so focused on the story. To see the whole story, told with the humor we’ve come to expect in Supernatural conventions, see this video from the convention. “Just My Imagination” looks to be a funny script, so it should be a good fit for Richard Speight Jr., who has terrific comic sensibilities. “Just My Imagination” airs Wednesday, December 2, at 9 pm EST on the CW.